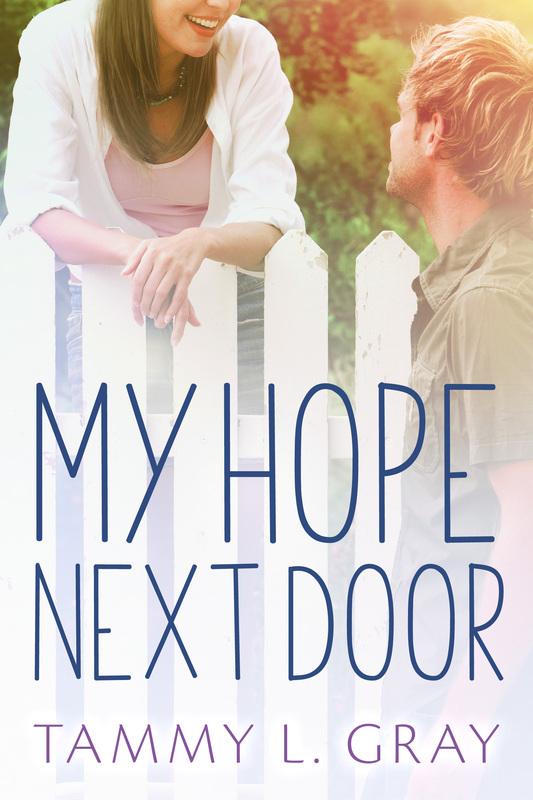 Tammy L. Gray’s latest novel, My Hope Next Door, is a phenomenal read! When Katie Stone returns to the small hometown she left years ago, she’s reminded of all the trouble she caused. But, she’s determined to right her wrongs and help her parents handle her mother’s recent illness. Asher Powell, her next door neighbor, becomes Katie’s greatest friend and biggest support. He has his own inner battles raging, but he recognizes the sincerity in Katie’s faith and her attempts at forgiveness. The unlikely friendship that forms between these neighbors may help to bring them both the peace and hope they long for, as well as second chances they never dreamed possible before. Having read and enjoyed all of Miss Tammy’s books, I had high expectations for this new novel. And I was not disappointed! The characters of this book, like all of her novels, were caught in very real scenarios: sins and drama that anybody could fall into in the real world. It made the characters more lovable and believable. The way she tackled the messages of forgiveness and love was well-thought out. She wove truth into this fictional tale, and she did it well. Once I started reading this book, I could not put it down. I was constantly pulling it out every chance I got to see what else Katie would try and how it would end up. If romance, forgiveness, and friendship are elements one appreciates in a novel, My Hope Next Door will not be a letdown! If I had to give this book a rating, I would give it 5 out of 5 stars. I have read almost every single book written by Tammy L. Gray, and none have had the impact on me that Sell Out did. Cody James is a guy who just wants to fly by. After being a victim of bullying at Madison High, all he wants to do is finish his time in school and get out without being cast from the social inner circle. However, with the addition of a beautiful, new student in class, Cody begins to question his role. All Skylar Wylde wants is normal. Being rock legend Donnie Wylde’s daughter does not leave much room for normalcy, but she hopes that Madison High can offer her some kind. When she catches the eye of the elite circle’s “king,” things become strange in both her life and Cody’s. I really enjoyed this book! I never realized that stories about bullying could be so intense. Once I started reading the story, I could not put it down! Cody’s story on its own was interesting, but with the addition of Skylar’s story and general high school drama, Sell Out was just awesome! Every spare moment of my time was spent reading this story. There were so many elements of the plot that I had to have answers to that I could just not stop reading. Miss Tammy has woven together a wonderful story that all should read. She includes not only the social impacts of bullying, but also the psychological impacts. Words and actions cut a lot deeper than most realize, and Tammy L. Gray has shown that in her novel. I highly encourage that you read this book, whatever your age; there is a lesson for everyone in Sell Out. This entry was posted on August 12, 2016, in BOOK REVIEWS, TAWNY'S TWO CENTS, Uncategorized and tagged TAWNY'S TWO CENTS. “Wow” is the only word I have to describe Rachel Hauck’s latest book, The Wedding Chapel. The mix of past stories, present stories, and family secrets made this book one of the best I’ve ever read. Jimmy Westbrook, also known as “Coach,” built a beautiful wedding chapel for the love of his life Collette Greer in the 1950’s. For sixty years, it has stood silent and unused in Heart’s Bend, Tennessee. When special interest in his chapel appears, Jimmy is thrust back into the world of his emotions, the ones he thought he’d buried long ago. Taylor Branson left Heart’s Bend to rid herself of the many family problems that lurked there. She finds herself in New York, and she falls in love with Jack Forrester, who is also a Heart’s Bend native. Their love connection leads to an elopement and some second thoughts, as Jack battles his own inner demons. When Taylor takes a photography assignment in Heart’s Bend, she discovers secrets and events that could change everything for her family. This book was absolutely amazing! Once I started reading it, I could literally not put it down. I would wake up earlier and go to bed later just to catch one more chapter of the story. The way Ms. Hauck set up the story was so different. Parts of the chapters were in the past, while there were whole chapters in the present. The Wedding Chapel taught me that love runs deep, you should never give up on love, and always go where you hear God’s voice. There were so many mysteries and questions I had, but by the end of the story, every one of them was answered. I give this book five out five stars because it is probably the best fiction book you will ever read. I highly recommend reading The Wedding Chapel by Rachel Hauck.